About one third of South Africa’s residential property market was financed by the state through the national housing subsidy programme. What does this mean for cities, for the private sector, and for households themselves as they work to turn this allocation into a real and performing asset? Since July 2018, CAHF and 71point4 have been piloting the Transaction Support Centre in Khayelitsha, with support from National Treasury’s Cities Support Programme. 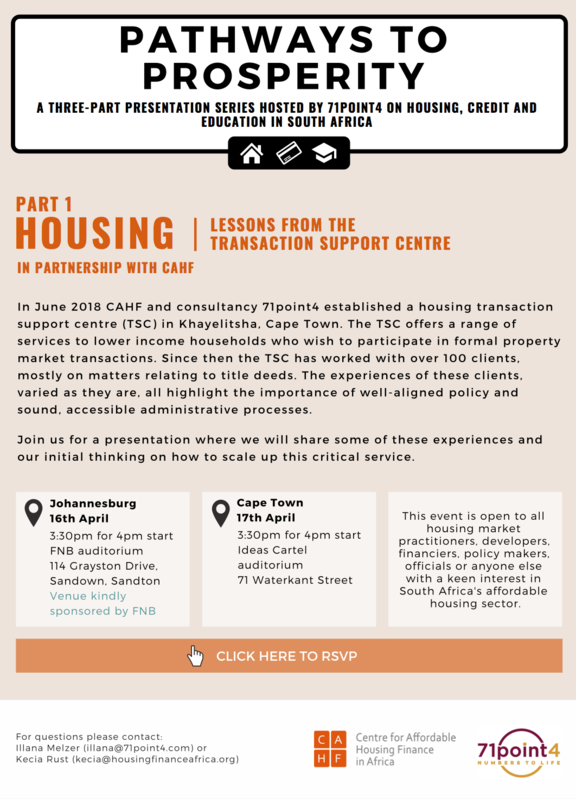 In working with over 100 clients we’ve learned amazing and challenging things about the transformative impact of the property market and how we might support the growth of what is the single biggest asset on most households’ balance sheets.